MORTON COUNTY — Ceremony, aromatic sage and drumming song welcomed the eight tribes of Washington State into the encampment of Native Americans supporting the Standing Rock Sioux Tribe’s protest of the Dakota Access Pipeline. 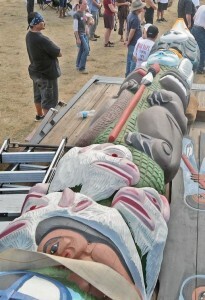 Tribes with new and unusual names — Yakama Nation, Swinomish Indian Tribal Community, Lummi Nation, Puyallup Tribe, Nisqually Indian Tribe, The Suquamish Tribe, Lower Elwha Klallam Tribe, and Hoh Tribe — entered the camp Tuesday afternoon accompanied by a 22-foot red cedar totem pole in beautifully painted Plains’ animals and symbols. These were the latest of now dozens, at least 70 it’s thought, to join the protest encampment that sprawls in tents and tepees across a wide meadow not far from the pipeline construction site. All is quiet there while a court battle plays out. Meanwhile, the encampment is a bustling and cheerful scene of new tribes coming to support Standing Rock, daily prayer, meal preparation and now a new school for the camp children. Jewell James, chief carver of the House of Tears Lummi Nation, (father of our own Shamania James) said the totem is the fourth he’s made to unite tribes and environmental groups in their stand to protect the earth. This one will eventually go to the native nations of Manitoba. “This is about little people against billionaire corporations. Standing Rock is clearly opposed to the pipeline, and I’m here to celebrate their clarity and their willingness to stand up,” James said. The totem truck was stopped and inspected at the Highway 1806 roadblock manned by the North Dakota Highway Patrol as part of the state’s response to the protest and people in the camp jokingly referred to it as the totem Trojan. JoDe Goudy, chairman of the Yakima Nation, wore traditional skins and headdress to the welcoming ceremony. He said the nations drove straight through 18 hours to reach the camp and stand in solidarity with Standing Rock. “You have our prayers, our support and our love regardless of the outcome. We know that we’ve already won in spirit. Don’t give up hope. We will leave our flag in your territory and carry your message home to our children. They are watching and listening to you,” Goudy said. Even as he spoke, the tribal nation flags were being raised along the roadway into the camp, the long colorful line resembling the entrance to the United Nations building in New York. Besides the Washington tribes, the chairman and vice chairman of the Navajo Nation joined the ceremony, each dressed in jeans and dark sports coats. James, the carver, said it’s rare to see the Navajos, a big nation and one with its own battles, at such events. “The world’s waking up, the mainstream media doesn’t control the message anymore,” he said. Navajo chairman Russell Begaye said he’s proud of the two dozen or so Navajo members who have been at the camp, helping with cooking and other chores that have become part of daily camp life while the protest is maintained. The totem was unwrapped on a trailer flatbed, and everyone was welcome to touch it, add their own power and examine the finely wrought detail of an eagle, white buffalo, bear, wolf and warrior. Standing Rock Chairman Archambault told the crowd how he feels as the Native American nations continue to arrive nearly every day. “At first, I was nervous and afraid and not sure we were doing the right thing. Now I can keep my head high — everybody is moving in this direction,” he said. Archambault and all leaders who spoke emphasized the prayerful, peaceful nature of the protest. Begaye, of the Navajo nation, said people in the camp are finding themselves and each other. “They finally feel like they’re a Navajo or a Sioux. They are seeing these are their people and there is healing and pride,” he said. 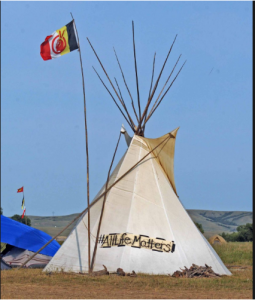 It’s expected the encampment will remain in place until at least Sept. 9, when a federal court judge is expected to decide whether to issue an injunction against the pipeline’s Missouri River crossing while it decides the Standing Rock Sioux’s claim that the U.S. Army Corps of Engineers failed to follow federal law in giving permission for the water route near the reservation. ← What would life be like in an Energy Based Economy? WHO ELSE IS WORKING TOWARD A BETTER ECONOMIC SYSTEM?